Coming off a hard fought, emotional overtime victory against the Miami Heat, a challenge for the Bulls will be to sustain the right mentality and come ready for their next opponent, which happens to be a formidable one. “It’s not easy,” said Joakim Noah as he and his teammates prepared to host the San Antonio Spurs, owners of the league’s best record at 46-16, on Tuesday night. 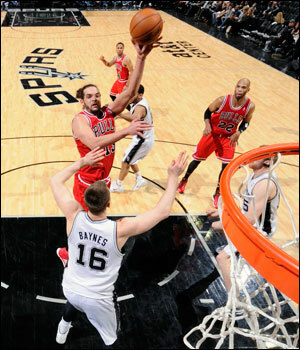 Bulls are 2-1 at the United Center against the Spurs. In that game on Jan. 29, Jimmy Butler’s 19 points led seven Bulls in double figures as they defeated the Spurs 96-86, marking the third time in the last eight seasons Chicago has won in San Antonio. While Thibodeau was obviously pleased with Sunday’s win, he referred to the team’s day in and day out approach that has helped Chicago go 23-10 since Jan. 1, best in the Eastern Conference. After practice, Thibodeau was asked about Derrick Rose’s status. Thibodeau would not speculate on whether or not Rose would return to practice this season.